The gastrovascular cavity is the primary organ of digestion and circulation in two major animal phyla: the Cnidaria (including jellyfish and corals) and Platyhelminthes (flatworms). The cavity may be extensively branched into a system of canals. In cnidarians, the gastrovascular system is also known as the coelenteron, and is commonly known as a "blind gut" or "blind sac", since food enters and waste exits through the same orifice. 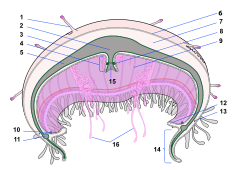 The radially symmetrical cnidarians have a sac-like body in two distinct layers, the epidermis and gastrodermis, with a jellylike layer called the mesoglea between. Extracellular digestion takes place within the central cavity of the sac-like body. This cavity has only one opening to the outside which, in most cnidarians, is surrounded by tentacles for capturing prey. Scott, Thomas A. (1996). Concise Encyclopedia Biology. Walter de Gruyter. pp. 376–379. ISBN 3110889560. Slobodkin, Lawrence; Bossert, Patricia (2010). "Cnidaria". In Thorp, James H.; Covich, Alan P. Ecology and Classification of North American Freshwater Invertebrates (3rd ed.). Amsterdam: Academic Press. pp. 125–142. ISBN 9780123748553.